CentOS 7 virtual machines on VMware will by default use predictable network device naming for network interfaces on the machine, causing their names to be in enoXXXXXXXX format. This will cause issues when adding 10 or more additional IPs in WHM, as network interface name will be longer than the 15 characters. Maximum length supported for network interface name on cPanel servers is 15 characters. When starting ipaliases service, only first 9 additional IPs will be added, and for rest of the IPs error “RTNETLINK answers: Numerical result out of range” will be shown, and IPs will not be shown in ip addr, or ifconfig output. Waiting for "ipaliases" to stop ...finished. Waiting for "ipaliases" to start ...finished. Oct 03 20:29:20 server.example.com systemd: Started cPanel IP aliases service. To resolve the issues, network devices can be renamed back to old ethX type of naming. To rename network devices to old names following steps are needed. Find a line containing “GRUB_CMDLINE_LINUX”, and append “net.ifnames=0 biosdevname=0“ on the line. File should look something like this. GRUB_CMDLINE_LINUX="crashkernel=auto rd.lvm.lv=myvg/rootvol rhgb quiet net.ifnames=0 biosdevname=0"
Rename enoXXXXXXXX network files of all interfaces to ethX network file. This will rename file ifcfg-eno16777984, to ifcfg-eth0, renaming interface eno16777984 to eth0, and will rename file ifcfg-eno33557248, to ifcfg-eth1, renaming interface eno33557248, to eth1. Edit new ethX network files. Replace value of both NAME and DEVICE field with new ethX names. 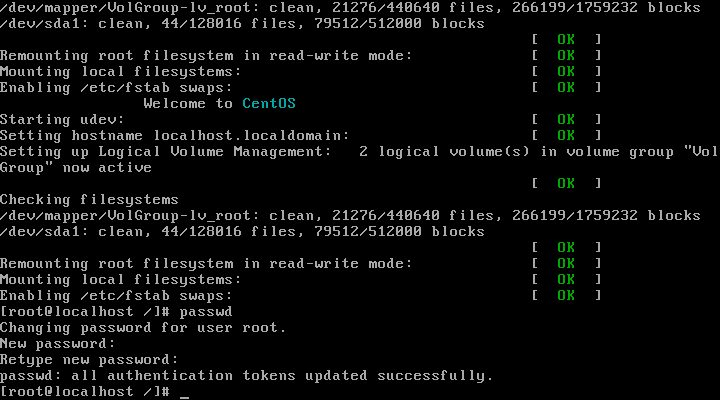 Reboot the server, and you should now see network interfaces using old CentOS 6 style names. Change public network interface in Basic cPanel & WHM Setup. Go to Home »Server Configuration »Basic cPanel & WHM Setup and change public interface from old enoXXXXXXXX to new ethX name. Restart ipaliases service with /scripts/restartsrv_ipaliases. If you have forgotten root user password on your CentOS 6 machine, you can reset the password to new value, without knowing the old one, by booting the machine to single user mode, and resetting the password with passwd command. During the CentOS boot process, you will be presented with a countdown before CentOS boot process actually begins to load the OS. Press any key to enter the GNU GRUB menu. 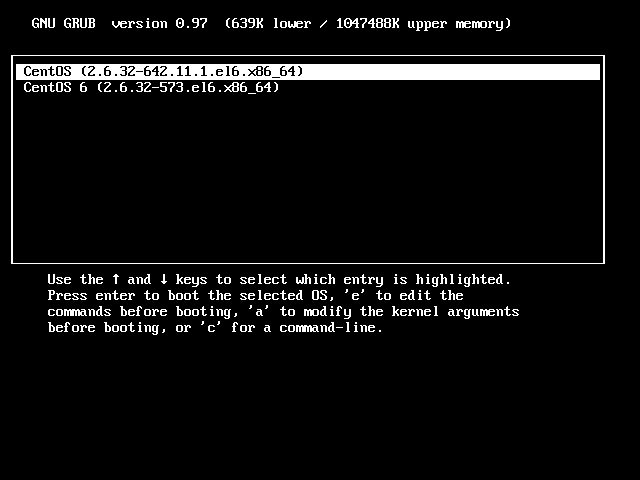 On the GNU GRUB menu highlight the kernel you want to boot, and press ‘e’ key to edit the kernel commands before booting. 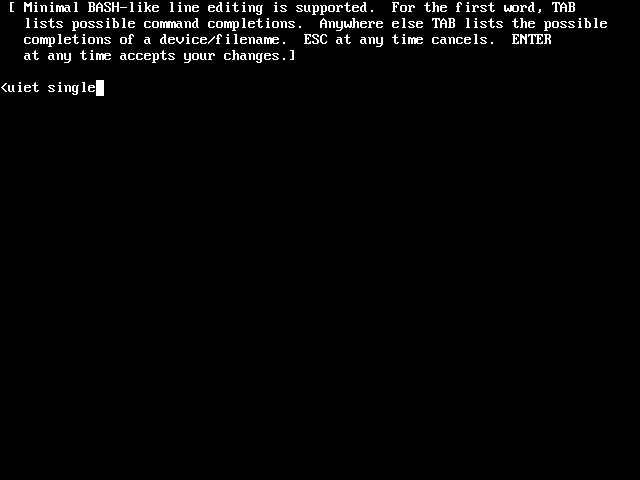 Once you have entered the kernel edit mode, find the line beginning with kernel, and highlight it, and press ‘e’ key to edit it. On the end of the line add the word ‘single’, with white space before ‘single’, and press ENTER to accept the change. Boot the machine with the edited kernel argument, and you will be logged in as root in single user mode. Now just issue passwd command, and enter the new password two times, when asked. Once you have changed the password, reboot the machine, and log to it with your new root password. By default drives will come with 5% of all filesystems allocated as reserved disk space allocated for privileged users, and not shown as available space. Since drives in use today tend to be large, reserved block percentage can be lowered to 1%, or specified to specific number of block. To set the reserved space to 2500 blocks “tune2fs -r 2500” can be used. To set reserved space to 1% of disk size “tune2fs -m 1” can be used. Several files and folders can be truncated or removed on /home. When EasyApache is run, it will leave file behind, that were used for Apache/PHP build, that can be removed if space is needed. EasyApache files can be removed with following command. cPanel FileManager can leave temporary files, that were created during user uploads. If you were moving any accounts to the server with WHM Transfer Tool, temporary account migration files can be left on drive. Disk space can be recovered by deleting Softaculous and Fantastico backups from user folders, if they are used. If you were making cpmove file manually, they will by default be created inside /home. Often large portions of disk space can be used up by large error_log files inside account home folders. If users have large number of account backups in their home folders, those can use up a lot of space. Disk space in /var can be cleared by deleting archived logs, which will usually end with .gz, or contain year inside their name, like such as “maillog-20161113”. Disk space in /var can get also get used up by core dump files inside /var/spool/abrt/ directory, which get created in cases of kernel panic. In case eximstats database is large, consider emptying the database, and changing retention settings. Disk space in /usr can be cleared by removing cPanel and Apache archived logs, or old installation files of Apache, and if installed, maldet. Every time you rebuild Apache with EasyApache, old installation files will be moved to “apache.backup*” directory. Similar thing happens with maldet, if it is installed, on updates, old installation will be moved to “maldet.bk*” folder. Although not often, sometimes maldet logs can use up a lot of space. Ebury is a SSH Rootkit, and password sniffer which steals SSH login credentials from incoming and outgoing SSH connections, and also steals private SSH keys stored on the infected system. 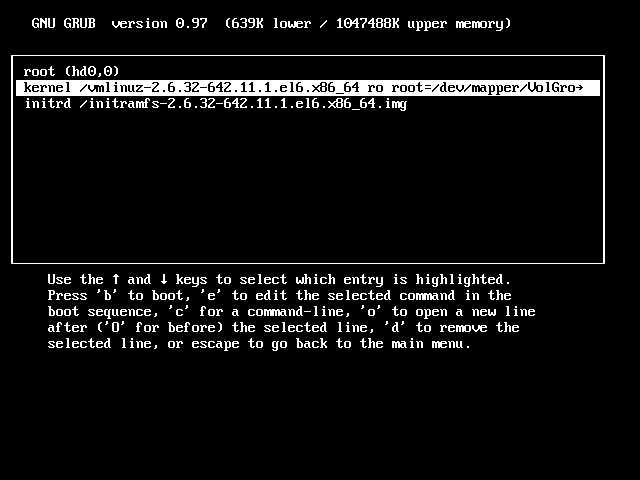 From version 1.5 Ebury uses Unix domain sockets for interprocess communication. Malicious process can be seen using netstat -plan | grep atd. This command should not return any results on clean systems. Atd should not be listening on any network port or socket. Ebury will also place additional shared library files, and patch installed libkeyutils file to link to those files. If any of those files exist, check if the files were provided by any rpm using rpm -qf command. On clean system command should return the name of the rpm package which installed that file. Here is a small script that can be used to check for possible Ebury infection. printf "This server appears to have atd process listening on Unix socket or network port\nCheck server for possible Ebury infection\n\n===\n`netstat -pan | grep -w atd`\n===\n\n"
printf "===\nFile $file is not owned by any RPM package, and there is a possible rootkit infection\nCheck server for possible Ebury infection\n===\n"
Some variants of Ebury will hide suspicious processes and files, if you are checking the system over SSH connection (link). In cases like that, checks will need to be done over local terminal, remote management console, or through screen session, for all processes and files to be visible. If you are unable to connect to the server without SSH, install screen with yum -y install screen, and run check4ebury.sh from screen session, to double check for any possible infection. In some cases when checks are done over SSH, you might be getting different result if you check for processes and files over screen session. In this example script doesn’t return any signs of infection when run directly from SSH session, but shows running processes and files when run through a screen session. Most important thing to note is, that in case of root level infections like these ones, the only safe way is to do a complete server rebuild after you clean the infection, and make any necessary backups. In order to clean Ebury infection, you need to kill the processes you found with netstat, remove suspicious library files, and reinstall keyutils-libs* rpm package. It would be also advisable to reinstall SSH packages. Check the actual keyutils-libs RPM packages you have installed on your system, and download them before removing any files from the system, as it is possible in some cases that some of the infected files are used by yum, curl, wget, and that you won’t be able to do install with yum after removing the files, or use curl, or wget to download RPMs for install. Kill all SSH connections with killall sshd. Kill the atd processes listening over Unix socket with kill -9 `lsof -Pt /usr/sbin/atd`. Remove the suspicious files you found, that were not connected with any rpm package. After you have reinstalled necessary packages, change your root password, and all SSH keys on the server, and reboot the server to check if suspicious processes and files will return after it. If possible, always do a full server rebuild, even if no signs of infection exist after reboot.